Depending on who's using the term, a "sandy" can mean making par on a hole in which you were in a bunker, or getting out of a bunker and into the hole in two strokes (a k a, getting up-and-down from the sand). Or another name for the pro tour statistical category officially called "sand saves" or "sand save percentage." Let's go over both uses and explain what the term means, starting with the tour stat. 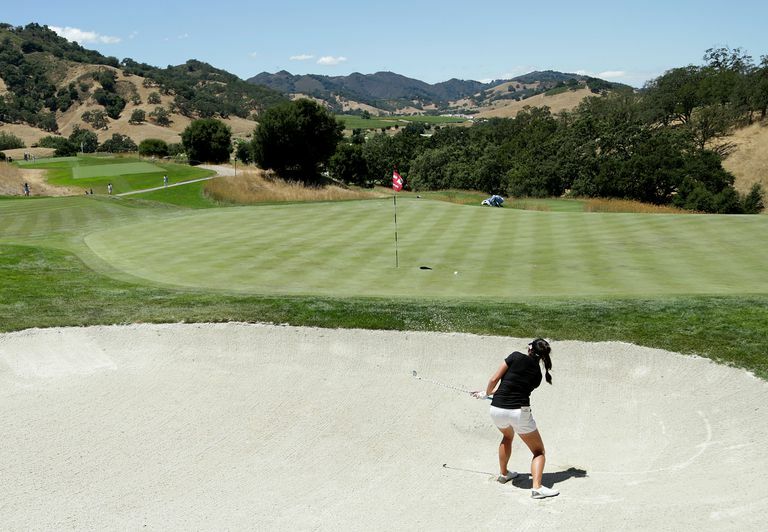 On the professional golf tours, one of the statistical categories is named either "Sand Saves" or "Sand Save Percentage." This stat tracks what the tour players informally call sandies. "The percent of time a player was able to get 'up and down' once in a greenside sand bunker (regardless of score). Note: 'Up and down' indicates it took the player 2 shots or less to put the ball in the hole from that point." In this usage, the score a golfer makes doesn't matter. If the golfer is in a greenside bunker on a par-4 hole, then gets up-and-down - whether that results in a score of 4, 6 or 12 - it's a sandy. So another way to think of sand save percentage is this: The percent of time a pro golfers earns a sandy out of a greenside bunker. For recreational golfers, "sandy" is more likely to refer to a betting game played within a group of golfers. In the betting game, each sandy has either a dollar value or a point value. Golfers in the group agree before the round, usually by saying something along the lines of, "We're playing sandies today, each sandy is worth a dollar." or (like in the pro tour definition) a golfer who gets up-and-down in two out of bunker wins a sandy. Obviously, golfers in your group need to agree on the particulars of the bet before teeing off the round.